Godofredo Vásquez Bohórquez (Godo) is Puerto’s best known lifeguard and the chief of the Heroico Cuerpo de Salvavidas. As to be expected, he is an expert surfer, having been introduced to the waves at age seven. During his 18 years protecting our beaches, he worked with a group of what had been volunteers and helped create a professional team that now is part of the Fire Department. 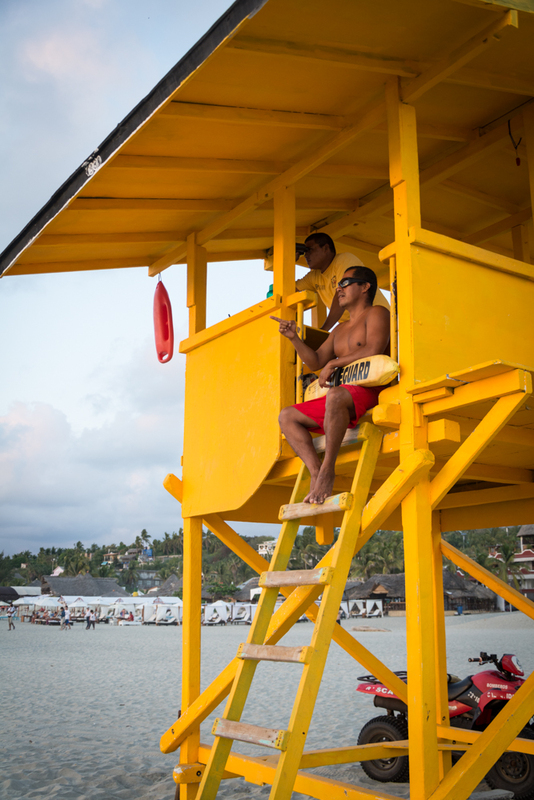 Twice a year, in March and December, Godo and his crew of nine lifeguards participate in a refresher course to prepare for Puerto’s two high seasons. Besides physical training, they also practice CPR and other life saving techniques, as well as ocean rescues. Contrary to popular belief, lifeguards are not trained in first aid. What they do is prepare the drowning victims for the paramedics. Zicatela, of course, with its big waves and treachorous currents, is Puerto’s most dangerous beach. But, incredible as it sounds, the Bahía Principal is the second most dangerous and not just because of the deep drop near the pier. The problem is with people going into the water after a few drinks or fully dressed in water-logged clothes. Beyond that, a lot of the bathers do not know how to swim. Last year, the lifeguards rescued 400 people and attended to two drowning victims. Godo stresses that when you go on vacation you should ask the local people where it’s safe to swim. Don’t just trust your eyes or last year’s experience. The main lifeguard station is in the middle of Zicatela across the street from the Hotel Ines. Besides Zicatela, there are towers on the beaches of Bacocho, Carrizalillo, Marinero and La Punta. The towers are staffed from 8 a.m. to 7 p.m. However, there is always someone at the Zicatela station to provide emergency assistance.